These are the transcripts of an interview with Goapele. The interview was conducted by Hugo Lunny on February 20th, 2004. Goapele's debut release on Columbia Records titled "Even Closer" is in stores now. She first sold the album independently, which was an immediate regional hit, at one point outselling 50 Cent's Get Rich or Die Tryin' in the Bay Area....selling more than 60,000 units and climbed into the Top 100 (#63) on Billboard's Top R&B/Hip-Hop Albums chart. 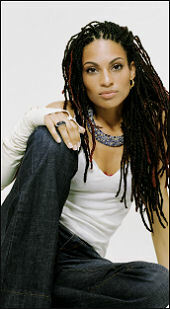 Goapele has worked with Hieroglyphics, Zion I and many other reputable independent Bay Area artists. Goapele: A lot of artists I listened to until this time; Miriam Mackeba, Hugh Masekela, Stevie Wonder, Bob Marley, Nina Simone, Roberta Flack, Prince, Bjork, Portishead, D'Angelo etc. MVRemix: What motivates you to actually make music? Goapele: I really like writing. It's fulfilling for me to create music and watch it turn into a song then get to perform it and see how people respond. What's personal to me and turned into something creative can effect them. That's inspiring to me. MVRemix: Now, my mother is Jewish and under the religion I'm classed as being Jewish also, although I don't follow the religion. Now I know you're the same, I'm wondering if you consider yourself as Jewish, or, you just recognize that your mother is and you follow a separate belief. Goapele: I'm South African and Jewish. There are certain practices and traditions that I grew up with, but I wasn't raised very religiously. It's more of a cultural kind of thing and just about my family history that I identify with. MVRemix: From "Red, White and Blues" (a song on "Even Closer") and the 9/11 theme - everyone when a tragedy occurs has a little death epiphany whereby they say they're "Going to live life to its fullest" and all the rest of it because of a particular tragedy. Have you been able to enforce that sort of practice since then or was it just like any other real death whereby people accept it, they mourn and they move on? Goapele: I think that there have been a lot of tragedies that have affected me in 9/11 along with the history that my family has gone through in South Africa. A lot of that has been tragic and there have been so many people in South Africa that have (under the Apartheid system) died or lived through some very unjust things. I have fortunately my family on my mother's side from my grandparents down. My great grandparents lost their lives due to the oppression in Germany so I feel like there are historical reminders that effect me immediately. Not to even begin with that I've grown up in the United States and watched a lot of people being treated unfairly. I've definitely experienced some unjust things in a lot more subtle ways than I feel my family has. I see 9/11 as an extreme to where a lot of people in the US, in a central place lost their lives. It was tragic, but there have been so many others things that have happened that I constantly feel we need to be aware of our decisions and which outcomes could emerge. Just try to have a positive impact and stay true to ourselves. MVRemix: So with that, would you say your perspective is that the glass is half full or half empty? Goapele: I feel I'm on a path and I'm very blessed. I feel very lucky. There are a lot of challenges. In general, I'm happy with where I'm at and I'm very thankful that this is what I get to do with my life. It's something fun and something that I believe in. MVRemix: Have you ever experimented with drugs at all? Goapele: Haha. What a strange question! Um, no. I'm not really into that. MVRemix: Tell me a little about "Even Closer." Goapele: "Even Closer" features songs I wrote with up and coming musicians and producers. I feel like it's a mixture of Soul, Rhythm and Blues, Hip Hop and Jazz. So many things. It's different reflections of who I am, a lot of the songs are introspective from personal experience with some of my views on the world and relationships. MVRemix: How did the relationship between yourself and Hieroglyphics come about? Goapele: We're both from the Bay Area. I definitely listened to Hieroglyphics, they've been doing their thing for a long time. Independently. We had a lot of mutual friends. I first worked with Pep Love on his CD just doing an interlude and then he worked on "Ease Your Mind," a song from "Even Closer." It really started creatively, then me doing singing on some hooks that A-Plus and Domino produced. Then from that we kind of formed a partnership businesswise. They helped us get national distribution when we were doing "Even Closer" independently. MVRemix: With regards to "Even Closer," a lot of artists once they've released an album go right back to the studio to record more. Have you started any work on its follow up? Goapele: Yeah. I've been doing some recording. Whenever I'm motivated I can write and that's the beginning. Sometimes that can manifest into a song in the near future and sometimes it takes a long time. I've mainly been concentrating on performing. I've definitely started recording, but I've been doing a lot of shows and travelling. I plan on doing more tour kinds of stuff to support the album, to get it out more in the US. I mean, it is available it stores, but just so people can experience the music internationally. Start getting distributed. Yeah, it's always good to keep recording. MVRemix: Talking of getting motivated. If you were along on a desert island and could only have one thing to inspire your creativity, what would it be? Goapele: Another person, haha. I wouldn't want to be alone on a desert island. Even as far as the recording stuff, I've also been collaborating with other folks. So, you know, meanwhile I've done a song with E-40. I've also done some work with Hieroglyphics, Aceyalone and Zion I. Its been nice to get to work on different projects off of mine. Goapele: Definitely, I love writing in general. There's a lot of. I do a lot journal writing, but sometimes stream of consciousness kind of poem stuff that may never make it to a song form but at some point I may still want to be out there. I enjoy the arts in general, even visual arts. I used to do that more when I was younger. When there's time I'd like to do more of that. I'm also interested in acting. Some of those opportunities may open up, so we'll see. MVRemix: What's most important for you for your happiness? Goapele: That I reflect who I am. That people see and appreciate me for who I am. To be involved in my community, to have a positive effect. To laugh a lot, to be with my family. To eat good food, to sit in the sun, haha. MVRemix: Can you predict your next year for me? MVRemix: Do you have any last words you'd like to put to your fans or potential fans that are going to be reading this? Goapele: I hope that they enjoy the music. I hope that 2004 treats us all well and I hope that they're on the way they want to be going in their own lives.